After sanding, priming, painting and adding antique silverware to my twenty year old, dark, dull and just plain outdated kitchen cabinets, putting in new counter tops, new appliances and painting the walls, I now have a beautiful, unique kitchen that I am proud to say was done by ME! What a beautiful job, you inspire me! I love the utensil pulls, did you buy those or make them yourself? Wow that is awesome! You should be very proud of yourself! Beautiful! 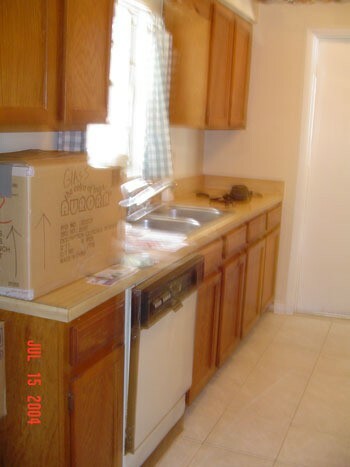 You really brought that kitchen to life. You have a one-of-a-kind kitchen that is so beautiful, the colors so appealing, the stained glass in the window a beautiful touch and I especially admire the pulls of antique silver. How did you attach them? Hope you will add more details of how you did it. Congratulations! Enjoy! 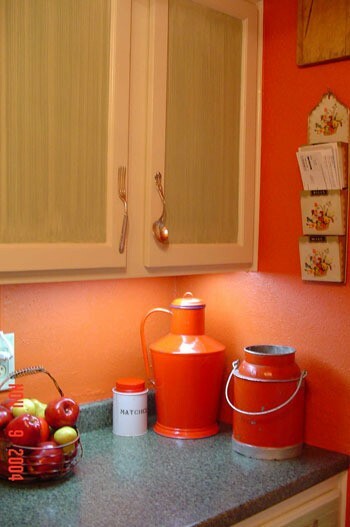 Oh, it is so beautiful and clever; and, I do like your countertop! 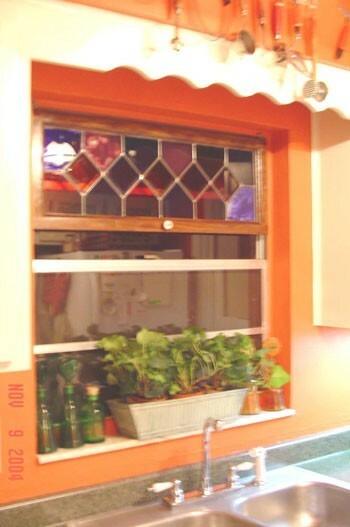 I just put one in in the same color....I redid my kitchen and have creamy colored cabinets and green ivy accents for color. Love what you did! Oh it is all so pretty. Can I ask how you made the stain glass or did you buy it and where or how? Hi Your kitchen is really nice...you come and do mine if you want to. How did you do the handles? That is AWESOME!! 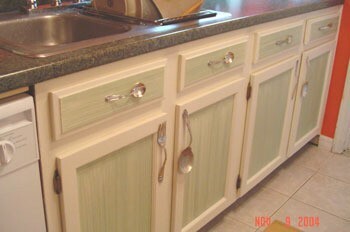 I love those cupboard and drawer handles, those are soo cute!!! You should go on "While you were out" or something! Beautiful job!! Love Your Kitchen!!!! You really did a good job, it looks very professional. Have you figured out already that the tines of the forks on your upper cabinets will hold a recipe card out of the way but in plain sight? Did you plan it that way or was that just one of those happy accidents? Either way ENJOY it, you deserve it!! 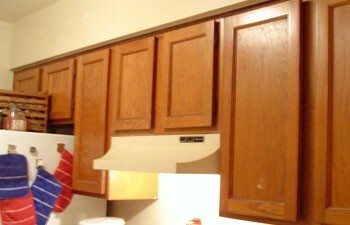 NICE, Was it difficult to use/bend utensils to use as draw/door pulls? How did you do the green insert paint, dilute? Wow!!!!! What a great job!!! What kind of technique - and how - did you use on the cabinet centers. I bet it feels really wonderful to be in the kitchen now! That is great. I love the handles on the cabintry. How did you mount them? you made it look excellent ! 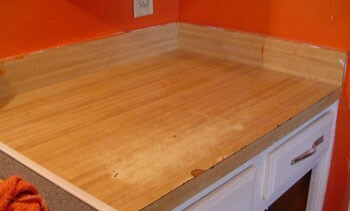 I just now read all the nice comments about my kitchen rehab. Thank you everyone!!! It was very time consuming due to all the prep work and I'm very picky but all in all, it was well worth it. 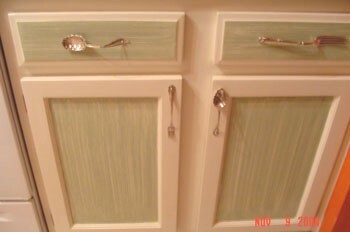 The green in the inserts of the cabinet doors is a simple faux finish and it's called dragging. I taped off the areas you see are white, thinned my latex paint with a little water or you can use faux finish glaze (Lowe's or Home Depot) and using an old worn out two inch brush, I dragged the paint from top to bottom. That's it! What I like about using paint mixed with glaze is that it wipes off easily if you don't like it but you have to wipe it off right away. I'm a professional scenic artist and faux finisher at Seaworld so I do lots and lots of painting. The holes in the silverware were made on my husband's drill press with a small drill bit. My husband flattened the fork prongs so no one would get stabbed accidentally but I like the idea of using one for a recipe holder! That's a neat idea. I cannot take credit for the silverware handles. I saw Christie Proctor do it on Trading Spaces. Paula, I bought the silverware on Ebay. Each piece is different and some are very ornate. Most were inexpensive.